How and when do I get paid? When does a payment transfer to my bank account? A timeline of how payment works on Kinnek and when you can expect payment to deposit into your bank account. When you’ve settled on a final price and a customer is ready to purchase, they pay you with our internal payment processor called Kinnek Pay. Customers can pay by credit card, wire transfer, or ACH. Credit card payments clear instantly, wire transfer clears the same day, and ACH payments take 3-8 business days. You can also request payment from your Kinnek Pay Dashboard. Search by company name for any Kinnek customer or enter an email address for any customer off Kinnek. Follow the instructions to send the payment request. The customer will get an email notification prompting them to pay. Click here for step-by-step instructions on sending payment requests. Alternatively, the customer can pre-authorize payment by clicking “Purchase Now” from their quote, entering their payment information, and hitting send. You'll get an email notification to accept the payment. Click here for step-by-step instructions on receiving pre-authorized payments. 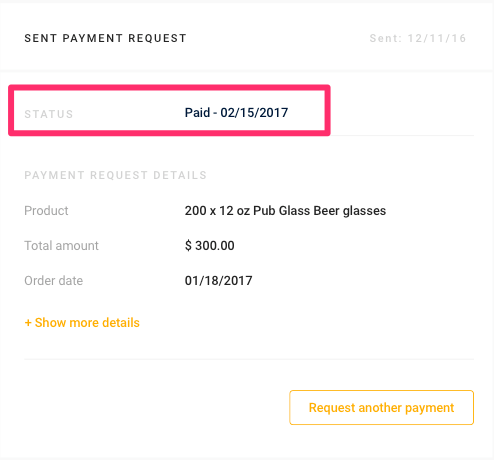 Once a payment clears, you’ll get an email notification and see the updated payment status in your Kinnek Pay Dashboard. If the payment was affiliated with a Kinnek lead, you'll also see the updated payment status within the lead. The lead will move to the "Leads Won" stage of your Pipeline. When your payment clears, you'll get an email update, and the money transfer to your bank account is guaranteed. You can go ahead and ship your product. Payment transfers occur on a daily basis and take up to 2 business days. This means that all of your cleared payments from a given day will be batched into one deposit. The deposit takes at most 2 days to transfer from Kinnek to your bank account. A business day is any day that’s not a weekend or federal holiday. For example: any payments cleared on a given Monday will be grouped together and transfer to your bank account by Wednesday, but payments cleared on a given Thursday will transfer by the following Monday. Once a payment transfer is complete, we’ll confirm by email. If the transfer includes multiple payments, the email will list all of the individual payments as separate line items.